After building multiple Versa wings, I figured I would try my hand at designing my own wing design. I decided to go with a Kline&#8211;Fogleman stepped airfoil for the simplicity and glide characteristics. In an effort to balance the air frame without adding any extra weights to the nose, I inset the motor closer to the CG. I believe having a horizontal "tail" behind the prop also helps smooth out the air coming off of the prop when it is not spinning (not to mention that it looks pretty cool ). 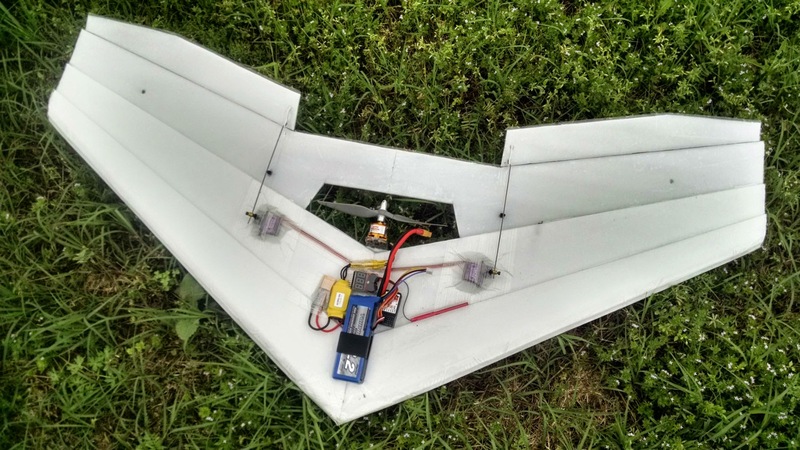 The air frame was made by bonding the 3 layers of the airfoil with hot glue and then removing all exposed paper from the foam board and re-skinning the whole thing with clear heavy packing tape. this made the air frame super ridged and water proof. This also made the wing unbelievably crash resistant. My first major incident was about 45 MPH straight into a chain link fence and there was absolutely no damage! I am about 50 solid crashes in and it is just now becoming time to replace the air frame. I added carbon spars for extra strength to the main wing and the tail section. All of the electronics Are secured with reinforced packing tape for strength and aerodynamics. It has a 1450 kv motor swinging a 7x5 prop with an 18 amp ESC. The 2200 mah battery balances perfectly. The thing flies like its on rails and glides better than I could have anticipated. Quite a wide speed envelope too. I plan to get some measurements and patterns up in the future along with a step by step build process if there is interest. Please enjoy the video of my sunset flight with the Sport Glider.